Installing a solar panel energy system will save you money, whilst reducing your carbon emissions at the same time. Great for you, and great for the environment too! Contact us for a free, no obligation energy survey on your property to find out the best solution for your needs. We can advise you on making the best use of solar power, and how to integrate this with high efficiency conventional systems such as an oil or gas powered boiler. We also offer two different installation options for your solar power. See some examples of the solar panel installations we have recently completed. Is there enough sunlight for it to work properly? Yes! We have solar powered systems that will supply hot water for your shower, bath, sink and swimming pool, and in some cases support your central heating too. Can you afford not to enquire about solar power? Call us on 01296 711 405, or email info@raceenergy.com to arrange a free, no obligation survey and find out how much you can save. 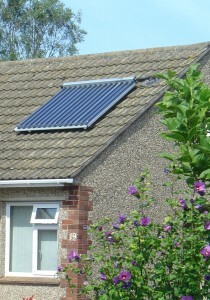 A solar hot water system on a typical house can reduce C02 emissions by over half a tonne!